The importance of improving customer experience on an e-commerce website is crucial for we can boost our sales. And when it comes to communication, which, basically, is a key element to build loyalty and relationships with your clients, we should never underestimate the influence it possesses on the overall website success. 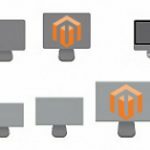 Therefore, Swissuplabs Ask it Magento 2 Extension provides you with the opportunity to take full advantage of user-generated content, thus simplifying various website management processes and decreasing the number of requests/questions coming to your personnel. So, having installed this Magento Product Question Module, the process of adding a question block becomes easier than ever. The extension allows you to place these blocks on any page of your e-commerce website, be it a product page or category page, you let your registered as well as guests customers interact with one another, by leaving comments on and discussing topics/products they are interested in. Moreover, website users are able to pose as many questions as they want, since the module does not impose any number limits. Having applied the Askit Magento extension, you are able to improve overall customer engagement on your website, and, as a result, positive perception of your e-commerce online business. With the assistance of this module, you let your customers interact with one another to discuss products they are interested in. All website users can leave questions/comments in question blocks, thus helping each other obtain real information on the items they are thinking of buying. Apart from it, the tool offers an opportunity of prioritizing the question lists by giving your customers a right to vote. To enable the feature, you just need to go to extension configuration and enjoy this feature. In order to have trustworthy relationship with your clients, Product Question module does offer private questions which are available for your registered users. However, as an e-commerce business owner you might get worried about questions spam, which is quite reasonable. But there is nothing to preoccupy with for the Product Questions extension provides the Akismet anti-spam service. 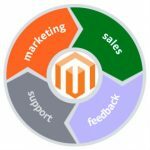 With the help of this question and answer Magento 2 extension, basically, you kill two birds with one stone: dramatically unloading your staff so that it could deal with other website management processes and getting a way much more user-generated content, which, in fact, has a direct and considerable impact on website SEO ranking. Moreover, other users’ comments have more chances to convince a customer to purchase a product since he/she trust the alike users, rather than a website owner. In case, you need to edit a certain answer, you will not find any difficulty for the tool’s interface does have a list of all available answers. As we have already mentioned, the Products Questions Extension provides an intuitive interface, with the assistance of which, you are able to easily manage answers as well as questions left in questions block on any page of your website. By means of applying a voting system, you obtain the data on product questions popularity, and, subsequently, discovering product issues that your customers are interested in. However, if there are some questions which have not been answered for a certain period of time, you are able to leave a comment or pose another question to a customer for you to understand what he/she actually wants to know. The Magento 2 extension also provides you with an opportunity to customize email notification templates for users and administrators of your website. 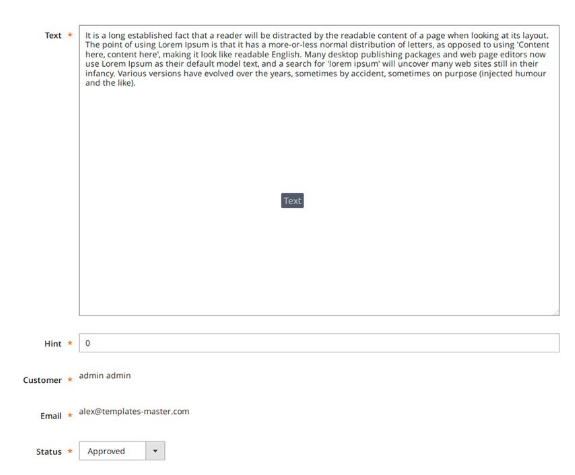 To do so, go to the module interface and find email template configurations. In the intuitive interface of Ask it Magento 2 Extension, you will be able to personalize general configurations of the module. Thus, you are able to define what would be default question and answer statuses, allow/prohibit website users to pose questions, enable a voting system, demonstrate customer name and as well as item on frontend, etc. As a result, you get full control over your webstore. To configure email notification templates as well as notification-related elements, go to the email category. There you will be able to enable/disable email notifications on new product questions, define a Sender, choose an email notification template, enter admin notification email, and determine which admin notification templates to apply. 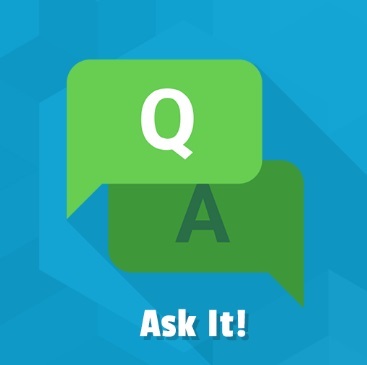 Get full control over your questions from askit blocks. In the following section, you can see what is going on with each question posed: username, date, status, customer email. In case you need to edit a certain answer, you will not have any trouble with it for the module’s interface lets you do it with ease. 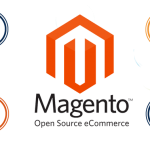 Swissuplab Ask it Magento 2 Extension is a powerful tool which will simplify various website administration processes, improve communication within your webstore, increase SEO ranking by means of driving user-generated content, build trust with your customers, etc. Therefore, provided you want to optimize the functionality of your e-commerce website, this extension is exactly what you are looking for.